The P750TM1/X4C is a robust gaming/3D machine that can max the GTX 1070 3D performance. With good temperatures, abundant features and ports, maintainability and upgradeability, this model is a very good all around solution for those who look for a high performance long term 3D/gaming machine. Price is relatively high, but with a discount for the right configuration, this model can offer more than other GTX 1070 models for around $1600. Software and availability of components remain a potential problems, but can probably be dealt with. GTX 1070 (laptop) (Pascal), GP104, 2048 cores @ 1.442GHZ - 1.645GHZ, 8GB GDDR5 @ 2GHZ (8GHZ eff. ), 256-bit. 386mm x 262mm x 38mm, 15.2" x 10.31" x 1.5"
The Eurocom X4C is Eurocom’s latest 15.6″ high performance desktop replacement. It is based on the Clevo P750TM1-G and succeeding the Clevo P750DM3-G. Like all Clevos’ desktop replacement gaming laptops, it can be configured to a relatively high degree, including the CPU, GPU (GTX 1060 or 1070), RAM, lots of storage options and usually a keyboard language and layout. The big change is mostly the move to the Coffee Lake platform and the Z370 Intel chipset. Eurocom, unlike others, also offers a GTX 1080 as GPU, but I suspect that it would be too much to the system cooling system and the default 330W PSU (which is otherwise an excellent choice). The 780W PSU upgrade is terribly annoying in terms of noise, turning on and off (my X7E2 experience). Speaking of the advantages of the P750TM1 desktop replacements over the slimmer models, the X4C/P750TM1 offer the benefits of a desktop system with a compatible cooling system, a CPU and GPU that can be replaced as well as supposedly high quality components and extras, including the keyboard, connection ports, speakers and such. Recently, many retailers (like Eurocom, HIDEvolition and others) offer the Prema bios which unlocks an array of bios capabilities, much like in a real desktop. However, they charge quite a sum for it. The usual slimmer and more lightweight GTX 1070 gaming laptops with an HQ CPU (only Kaby Lake CPUs for now) are sold for $1300-$1400 at the least and G-Sync, but typically narrower connection ports selection and no option to replace the CPU and GPU. That’s around $300 cheaper than the X4C with a 8700K and GTX 1070, but including 10% off students discount the difference is quite small. If you remove the G-Sync option, you’ll save another $90 (not really required for 1080p resolution with a GTX 1070). A machine like the Asus GL502VS goes for around $1500-$1600, for example. I wanted to review the P750TM1 mostly because it’s relatively lower price for the hardware, its upgradability, and because I like a 15.6″ machines more than 17.3″ (but that’s me). The Eurocom version offers a lower price for this specific configuration, compared to the competitors, especially those who sell the Sager brand. The difference can come to up to $200-$300 easily, and that’s before the Eurocom 10% students discount. However, some upgrades cost more on the Eurocom site (like the 120HZ display). The specific configuration I went for is GTX 1070 + I7-8700K. The reason for the Nvidia GTX 1070 is that there are very cheap GTX 1060 laptops today to the point of making a GTX 1060 desktop replacement considerably less attractive, even when taking into account its advantages. The reason for the Intel I7-8700K is that it will interest many how it performs in this machine, but personally, I wouldn’t recommend it for gaming in this machine or even a desktop (with a GTX 1070), since the I5-8600K with its 6 cores will perform as well as the I7 12 cores for gaming with the benefit of being less hot with more TDP room for high clocks and even OC. The X4C will be $145 cheaper with an I5-8600K and I think that for gamers that would be the right choice and anyway, it can be replaced later on with some more quality CPU then you’d get from the OEM. (There may be some rare gaming scenarios for which an 6 Coffee Lake cores won’t suffice when coupled with a more powerful GPU, but I bet the difference will be insignificant and we don’t have GTX 1080 Ti in this laptop anyway). So, the X4C/P750TM1-G is a tempting offering when configured correctly, both for gaming and as a multimedia machine, video editing and such. Outer chassis build quality is rather good, based on a rather firm plastic. It will yield a bit under high pressure, but it’s barely noticeable and nothing that should compromise the inners health. Unfortunately, as with many other laptops, the screen unit and outer lid screen protection is my source of worry. Though the lid is not soft, I suspect it won’t protect the screen from a sudden (or not sudden, well crafted) pressure, like a leg, a bag and stuff like that. That’s no news from previous models, but still is annoying to me. In comparison, the Lenovo Y720 was better in this regard and models like the Dell Latitude E7XXX are much better, providing hard cover and good protection against very high pressure (battle tested by myself). The display unit itself can be easily twisted on its axis, which is another point of concern, but not really something to worry about since it’s a common scenario. Overall, as far as outer chassis build quality goes, I have no news over the previous models. The Clevo P750TM1’s body feels robust, but the screen shock prevention capability is low. The chassis of the P750TM1 is quite similar to the the previous generation P750DM3. It has a big bulky plasticky looks, but unlike some of the older models, it doesn’t have sharp edges. Personally I like the simple smooth looks with less trying too hard to look different – some stores added an option to remove branding altogether, which is very nice in my opinion. The maintenance of the Clevo desktop replacements has been known to be quite good with most of the inner stuff easily accessible. If find it to be the same with this machine. It is very easily to remove the maintenance hatches. I did have a bit of a problem installing an SSD in one of the M.2 slots since it was hard holding the screw in place with no room for fingers or even the screwdriver. Removing the keyboard may be a little harder. You have to remove two screws marked with “KB” letters, both are pretty close to the CPU area. After that, you need to insert some think stick inside the more central “KB” screw hole in order to pop the keyboard out. Do it carefully, otherwise it might break. The keyboard is also held using a magnate. I think this method is more prone to destroying the keyboard. Under the hood you’ll find the CMOS battery, two DDR4 slots, M.2 WLAN slot. I don’t have images of the upper part of the motherboard for now, sorry. The CPU has three dedicated heatpipes , two leading to one fan and one to the second fan (the GPU fan). It has one shared heatpipes with the GPU, connected to the GPU VRAM. The GPU has additional two nice heatpipes leading to one fan. These are cooling the core itself and some VRAM. Keyboard. The X4C uses the standard Clevo P750TM1 keyboard, which is a very good keyboard. Good keys separation, very good feedback and response with enough travel depth. Typing on the keyboard is certainly quite a nice experience (for a typing experience). That’s probably and advantage of bigger machines – they allow for a less compromised keyboard, at least compared to current keyboard offerings in the gaming laptops space. It does sound to me like there is some squeaking noise while hitting some of the keys – nothing too noticeable, but it’s there. Probably won’t bother most of the people. I hope it’s not an indication for a low quality build quality. The keyboard is a multicolor backlit keyboard with few configurable key zones. The colors look good. There are 4 backlit levels including off. Touchpad. Big and rather smooth touchpad, but clearly not one of the top quality pads in terms of smoothest finger ride (on the pad). 2.0 speakers system, located at the upper top front of the machine, protected and hidden by a typical black metallic grill. I’ve uninstalled the SBX software completely due to past experience for the testing, including no Windows “enhancements”. Subjectively, the speakers produce pleasant, gentle sound, with rich and rather deep mids and mid-highs. The speakers are also quite clear with good sound separation and good details, but they are obviously not perfect in this regard. In the low department the 2.0 system obviously lacks some, but from what I can judge, the higher lows are mostly there, and only the lower lows won’t be significantly pronounced with this system. A clear drawback is that the speakers lose it a bit with the low bass – at least when set to higher volume – and get out of control with distorted sound. However, using the SBX “Connect” equalizer software (which I installed later), reducing the basses considerably helped eliminating the distortion and didn’t really hurt the sound too much in my opinion – probably removing those sounds that the speakers couldn’t produce right anyway. I would suggest doing it. For instance, Dave brubeck’s “Take Five” sounded pretty nice. I could hear many different sounds clearly, but the caveats mentioned above remain. Overall, I’d say the 2.0 speakers system in the X4C/P750TM1 is one of the better ones in the gaming laptops space (though the competition is mostly weak). Most people will be satisfied with the speakers for music and gaming. For 1440p and 4K resolutions, DSR was in use. Gaming performance is the top of its game for such a laptop. Comparing the numbers to laptops with a Kaby Lake I7 (7700HQ/7820HK/7700K), the P750TM1 is as powerful or much better, probably because of the better thermals and the extra FPS from the faster single core performance. I’ll use table for comparison. Please remember that these numbers include many game and driver and API versions, so huge differences might be just that. That’s across all my benchmarks and Notebookcheck benchmarks, that’s including the Tornado F5 (I7-6700K + GTX 1070). You can see that when compared to other GTX 1070 laptops (till now) either there is some small advantage in performance or the performance is roughly the same. All numbers from the notebookcheck are taken from here. Anandtech benchmarks are taken from here and here. 2. Gaming : Mass Effect : Andromeda, Highest@1440p settings + Civilization VI 2160p Ultra, MSAAx4. Clevo “Performance” power mode. 3. Prime95 torture test. Clevo “Performance” power mode. 4. Prime95 + Furmark on 1080p test, AAx2. Clevo “performance” power mode. Thermals are very good for such a hardware. Stable temperatures for Prime95 are under 80C which is quite good compared to other machines, including the likes of the bulky MSI GT62VR (check here), even considering the throttled CPU and GPU. 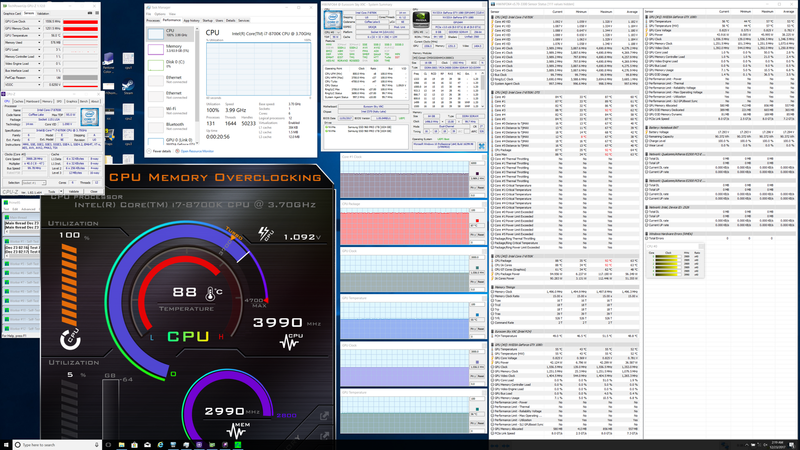 Even running Prime95 + Furmark doesn’t fill up the temperature bars of the P750TM1 with the CPU kept around 85C. Compared to the previous generation P775DM3-G, these are 15C lower for around the same clocks or higher, which is a very good improvement. At first I got worse results with the I7-8700K and I’ll explain later how it is [partially] solved. The P750TM1’s CPU and GPU do throttle sometimes and its mostly due to the TDP limitations and not temperatures. The CPU reaches its 95W limitation. (though there is some link between the two as higher temperatures usually mean higher power consumption in these kind of chips). The I7-8700K can maintain 3.9-4.0GHZ easily under Prime95 load (compared to its configured 4.3GHZ). I could get it to work at 4.3-4.4GHZ under 100% Prime95 load (Large FFTs option), but it requires considerable downvolting of around -150mV. It was stable while the system was loaded, but at the moment the load was gone, the system would become unstable. The GTX 1070 can maintain high clocks under gaming load. Under Prime95 + Furmark, the system somewhat surprisingly will maintain the same level of clocks (around 3.9GHZ), only the components will are hotter. I would bet that an aftermarket I7-8700K will have a good chance of having better voltages and temps. The story is this: at first I got worse results. The I7-8700K would run @3.3GHZ under Prime95, limited by its 95W TDP – this is very low clock rate for 95W. However, the voltages seemed very high while operating, and by experiencing, I knew that it was stable even if seriously downvolted (reached -170mV). Moreover, the NBC P775TM1 review with an I7-8700K showed much better clocks for the same voltages even though their temperatures are higher (link to the review). So, finally after some tests, it seemed that -100mV downvolting is a good downvolting value and results in a more reasonable voltage under load and reasonable clocks, much like in the NBC review. I don’t know why it is like that, but either the CPU is of low quality or (more reasonable), the system is not well tweaked (perhaps the bios itself). Could be both. The chassis temperatures of the P750TM1 are relatively ok. Most of the keyboard remain within temperatures that should be ok for most people, even under high load of Battlefield 1. Noise levels are ok for low and moderate loads. The Clevo P750TM1 doesn’t speed up its fans for vain and you won’t get ambushed by a renegade fan deciding he has to cool something. Moreover, there is some control via the Clevo Control Center that allows to raise the bars for minimal fan triggering temperature. This specific configuration includes a 1TB 7200RPM HDD and it produces a constant hamming which is easily noticeable when the fans are off. However, when loading the system with some serious 3D game, the fans will fire up and be rather loud, even when not on higher speed. The noise is higher than other GTX 1070 based machines with an HQ CPU. Power save mode didn’t help here much. Nvidias’ “whisper mode” helped a bit in my tests, but not a lot and only in cases where the game is considerably less demanding in the played graphics settings. For example, CoD:WWII will easily run on around ~100FPS with highest graphics settings@1080p with this hardware, so activating the Whisper mode on 40-50FPS should help. Nvidia claims this mode optimizes for power efficiency, but I’m not sure how much it does that. The HWInfo stats while playing the game show the GTX 1070 average power consumption was close to the peak, even though it was limited to 45FPS.. Whatever Nvidia do, it doesn’t seem to be very well done. The X4C uses the LG LP156WF6-SPB1. That’s an eariler LG 1080p 60HZ IPS model from a line which has appeared in various other laptops in various versions. The LP156WF6-SPB1 is a good model, but there is nothing exceptional about it compared to most others. Maximal brightness can reach ~300cd/m² and contrast is around 1:700 which is good and is typical for current gaming laptops, including almost all of them. Color coverage is around 93% sRGB and 72% NTSC, which is also typical and should be more the sufficient for most users and uses. I wouldn’t recommended for very high quality and refined photo editing, though. In contrast, the line of cheap(er) high performance models (Lenovo Y720, Acer Helios 300, Dell 7577 and 7567 and others, Asus FX502VM) use displays with lower color coverage of around 45% NTSC. Response times are also average at a typical 25ms (rise + fall). That’s around what we’ve become accustomed to from 60HZ models. Overall, a good display and the vast majority should be satisfied with it. Eurocom offer two other options : 120HZ TN B156HTN5.2 with lower response times and a 4K LTN156FL02-101. Both of these lack in colors and except their specific mission (120HZ and 4K respectively), they are hard to recommend. The 120HZ display also has rather limited viewing angles (meaning the image becomes distorted when looking in angle). I would consider getting some specific low response model or 4K model which are more high quality. For a 120HZ display – no really good options right now for end consumers, but perhaps there will be soon AUO G156HAN2.0 looks promising. For a 4K display, I’d go with one of the higher quality IGZO displays. Just remember to get a suitable 40pin->40pin eDP cable. Not using Optimus and relying on a relatively high energy consumption hardware like the GTX 1070 and I7-8700K, this machine consume quite a lot for relatively simple tasks. Idling will require 20-21Wh, working/browsing lightly will set you back around 31Wh. The battery will suffice for around 2.5-3 hours of 1080p@30/60FPS or 4K@30FPS youtube video (Chrome 63). GPU overclocking done via MSI Afterburner (less limited than the Clevo GPU OC software). I didn’t try modded drivers to unlock the GPU’s voltages dials. The GPU is obviously mostly limited in TDP anyway, so even this slight improvement is a nice touch. This will total at $1617 before 10% off for students and $1456 with 10% off. I would consider replacing the display manually if you want 120HZ one. The P750TM1-G is a heavy duty machine, equipped with a Coffee Lake desktop CPU and an MXM GPU, and it can handle the 6C/12T I7-8700K just fine. It delivers a desktop level gaming performance. Gaming performance in my tests show good FPSs at the top of the competition, compared to other GTX 1070 equipped laptops (though frankly, non with Caffee Lake). Temperatures are kept rather low even in full load scenarios and are lower compared to the current competition and even Clevos’ previous generation systems like the P775DM3-G.
Saying that, for pure gaming purposes, I would go with an I5-8600K instead of an I7-8700K. Not only it will have lower temps and lower power consumption, but it will also be able to reach higher clocks probably. Performance in games should be the same or better, actually, thanks to less context switching and not using the HyperThreading. The P750TM1 comes with tons of connections ports including 2xmDP v1.3, HDMI 2.0, Thunderbolt 3, 2×2.5″ SATA bays, 2xM.2 NVMe slots and more. Maintenance is rather easy, though removing the keyboard is a bit scary. The most annoying caveats in my opinion are the software/bios/CPU problems which result suboptimal CPU clocks and performance even though there is no good reason or real limitation – that’s unless you manually set a -100mV offset. I think a bios update or the Prema bios can fix that. On top of that, the Clevo software (Control Center) resets the manual voltage offset and also doesn’t really let you do it via the CCC software itself. Pretty counterproductive for a high performance gaming machine aimed for high clocks with its desktop CPUs. The price over the web is rather high at around $1800-$1900 for this configuration (and even higher for “Sager” branded laptops), but the price can get much lower with Eurocom’s 10% student discount and getting an I5-8600K to total at $1550-$1600 (which is probably the best price for such a machine). Going for an I5 and finding a discount would be my suggestion. Non desktop-replacement GTX 1070 equipped laptops (GL502VS, GE63VR, Y920 and more) are selling for around $1500 and up and usually perform worse, besides other disadvantages (upgradeablity, ports). However, some are slimmer and more lightweight and the cheaper models like the Asus GL502VS/GL702VS are sometimes discounted, and can be bought for as low as $1250-$1300 and for some that would be a better choice. Currently, these are equipped with a Kaby Lake HQ CPU, but that will change soon. The main downsides, in my opinion, are (a) the funky TDP/voltage behavior resulting in lower CPU clocks unless treated. That perhaps could be solved with a bios update (b) The Clevo software which is bloated and interferes with downvolting. (c) Although upgradeable, availability of components for a reasonable price is not guaranteed, especially the motherboard and MXM GPU. True to all Clevo desktop replacement models, at this point. All around desktop replacement 3D machine for a reasonable price – top desktop level performance, lots of ports, relatively high upgradeability and maintainability and even good enough speakers. The Eurocom X4C, the one in review, can be found here. Remember they have 10% off for students. I noticed with my Clevo under heavy CPU+GPU loads Throttlestop will show that BD PROCHOT will trip which down clocks CPU but causes an unstable clock. It will run at max trip BD PROCHOT then drop only to jump back up and trip it again. When BD PROCHOT is unchecked via Throttlestop instead of down clocking CPU it will trip GPU power limit which drops GPU performance to the same as it would be if it was on battery. I blame those issues on bad software and the “standard” AC adapter not being able to provide quite enough power.